You know how once you’ve exercised you think you can reward yourself with extra calories? Like you’ve really created this incredibly large window for indulging? That rationalization may have happened to me recently after I completed a local 5K race. I shouldn’t technically even get to call it a race. As a walker, they didn’t put a tracking chip on my bib, so my results weren’t recorded or published. It was more like I was taking a leisurely walk in an unfamiliar neighborhood with 764 strangers wearing a tiny random number sign pinned to my front. In any case, a morning of “racing” was followed by a most delectable breakfast during which said rationalization took place. 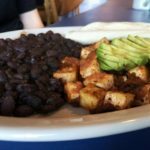 Bellingham has no shortage of fantastic breakfast joints. Mount Bakery and Little Cheerful Cafe are popular weekend spots and rightfully deserve their own write-ups at some point. But on this sunny May day my party of three took advantage of the fabulously vegetarian-friendly Old Town Cafe. 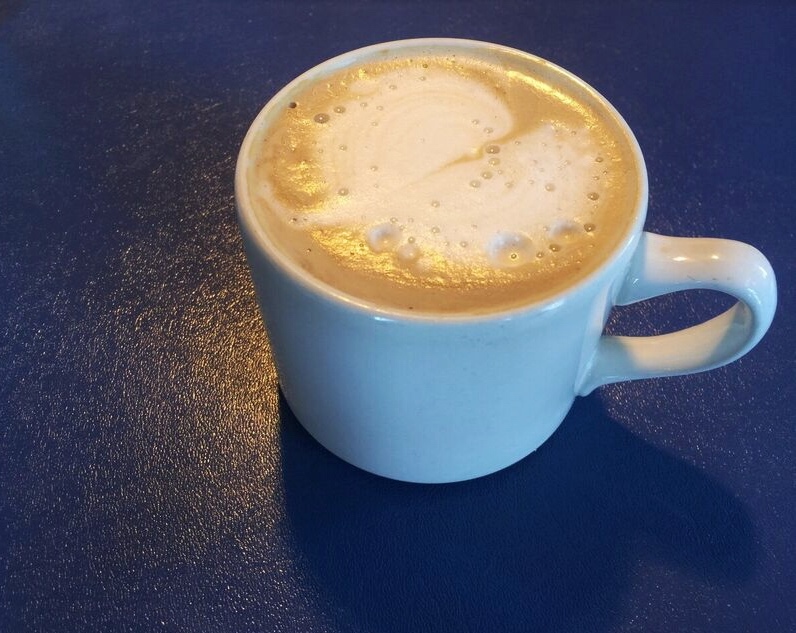 I started with a decaf vanilla soy latte. Then ordering got difficult. I wanted to try their granola, but my attention was drawn to the list of bakery specials on the chalkboard, in particular the marionberry sour cream coffee cake. When I expressed concern to my breakfast-mates about granola with a side of coffee cake being decidedly too much food for one meal, my friend replied, “But you just completed a 5K.” So I ordered both. Sound familiar? 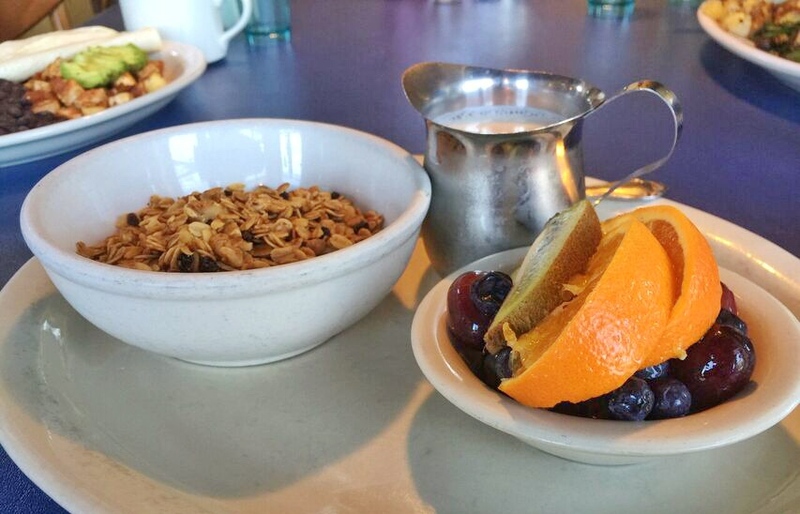 Let’s start with the nutritionally reasonable part, Old Town Cafe’s fresh granola: nuts, currants, honey, butter, cinnamon, and real vanilla, served with fruit and soy milk. The texture was very pleasing and stayed crunchy throughout. The flavor was simple but enjoyable, though I was a bit disappointed by the fruit selection. The kiwi and orange with their peels still on weren’t easily sprinkled over the top of the cereal and the blueberries were defrosted from frozen so were a bit mushy. Luckily the crunchy grapes saved the day. Jeff and our friend ordered dueling tofu scrambles, and both happily cleaned their plates. The scrambles start with cubed organic tofu grilled with cumin and tamari, and then get personalized with add-ins from there. 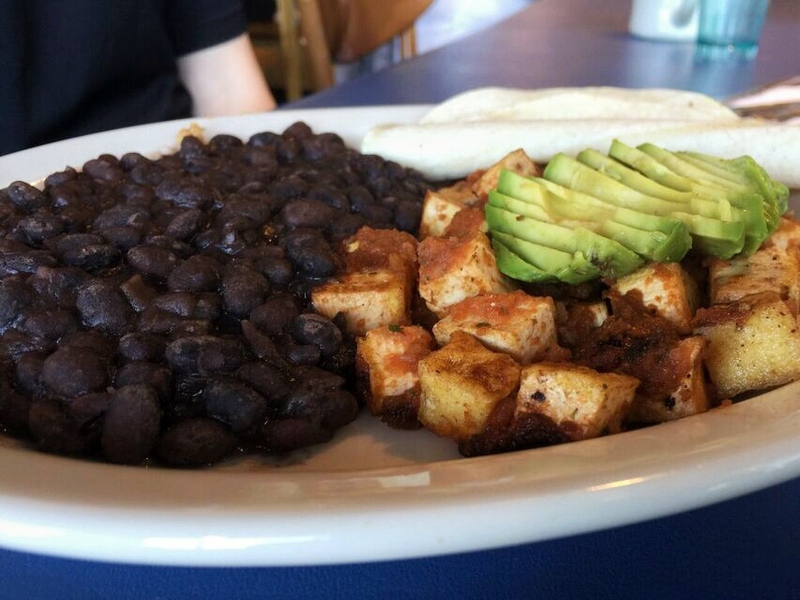 Exhibit A: Southwest Tofu Scramble with salsa and avocado; black beans and corn tortillas on the side. 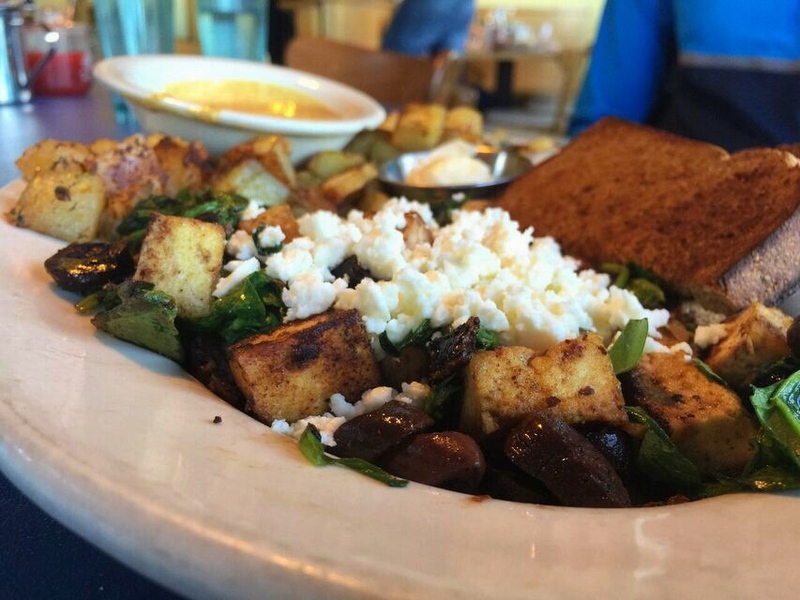 Exhibit B: Greek Tofu Scramble with fresh spinach, feta cheese, Kalamata olives, and garlic; home fries and whole wheat toast on the side. 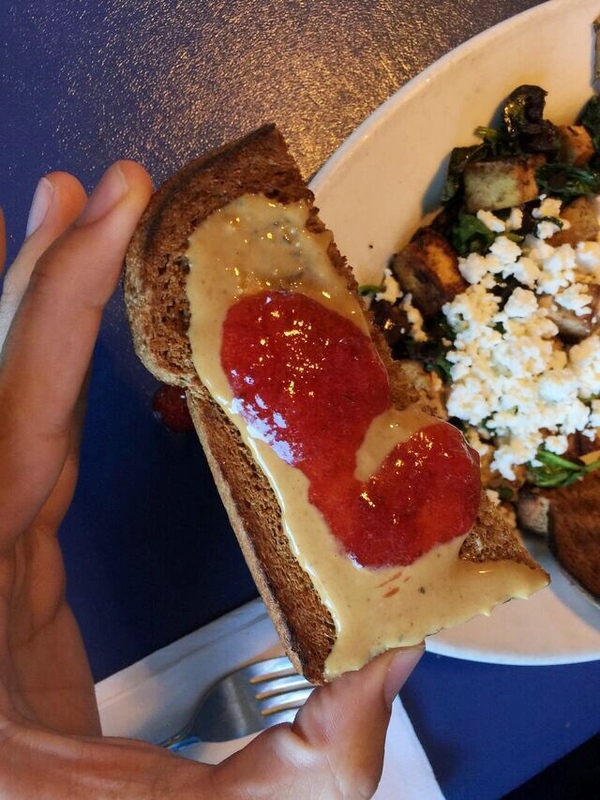 For the side of toast, the waitress offered buttered or dry, with the option of (natural, non-hydrogenated) peanut butter and jam. Our friend was particularly proud of his culinary artistry with this application of said toppings so posed for a photo-op before digging in. When I ordered the granola with soy milk the waitress double-checked that I was OK with butter in the granola recipe…perhaps thinking I might be a vegan. When we arrived there was a half hour wait. So we jumped at the chance to sit at a “community table” with the promise of being seated immediately. We had the end of an 8-person table to ourselves and made friends with the ladies at the other end to boot. They offer soy milk, rice milk and almond milk in addition to cow’s milk. Field Roast vegetarian sausage is on the menu, and most of their bread is from Great Harvest Bread Co.
Let’s get back to the misguided meal justification and look at the numbers. Mostly walking with spurts of running, my 3.1 mile journey took 41 minutes and burned about 260 calories. Seems worthy of a splurge, right? In comparison, my best guess is that the 8 ounce (half pound!) 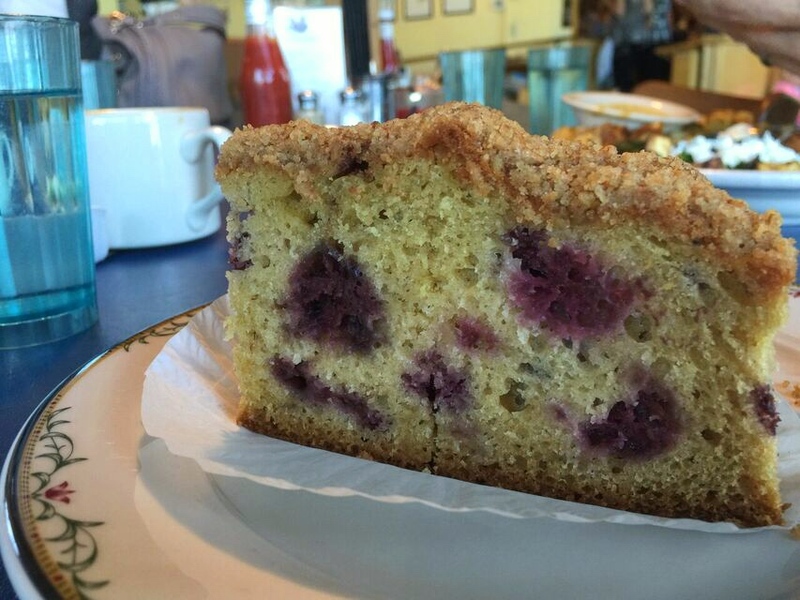 piece of marionberry sour cream coffee cake likely had 950 calories. Not exactly an even trade. 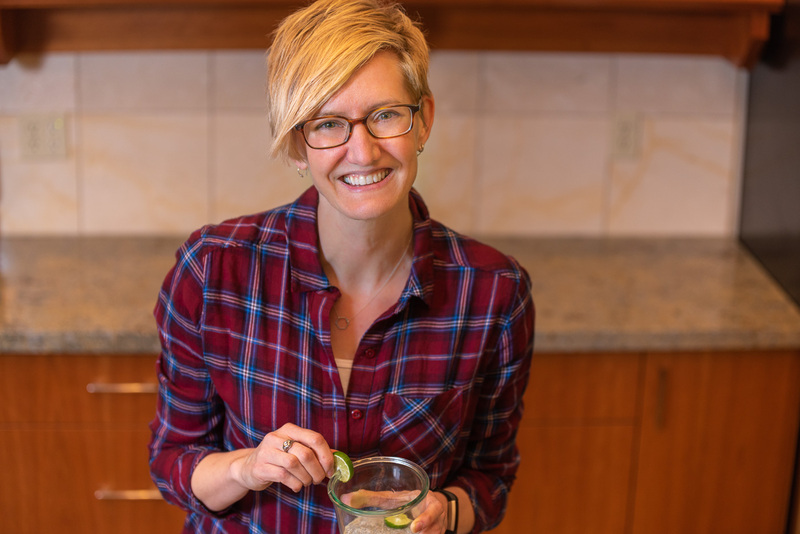 It’s easy to be lulled into an “I deserve this” mindset after we exert ourselves physically, and sometimes a long hike or intense soccer match can make room for a few hundred extra calories. But in many cases we’d be better off benefiting from the calorie deficit instead of overdoing it and ending the day with a calorie surplus instead. My best advice, for myself included, is to be realistic about how much we really spent and choose our compensation wisely. On this early morning of non-racing and rationalizing, the Old Town provided a perfect spot for conversation and good food. In the end, my granola filled me up completely and I decided to take the gargantuan piece of coffee cake home for another meal. Or six. How do you eat after a good bout of exercise? Do you like to treat yourself for a job well done or keep the healthy streak going by avoiding the temptations? In case you were wondering, this is not a sponsored post. I received no compensation from this restaurant for my review. I paid for my meal and decided to write about it because I was a satisfied customer. It does underscore how out of control so many restaurant portions are, when you would have to be training for the Olympics in order to burn off the calories through exercise. Hi Stacy. I love your comment about “training for the Olympics”. Wish I would have thought of something that clever to write in the post!